What Will the Annual Cost be for My Generator? It is true that the cost of a standby generator doesn’t stop with the generator itself, but there is a cost to run and maintain it. 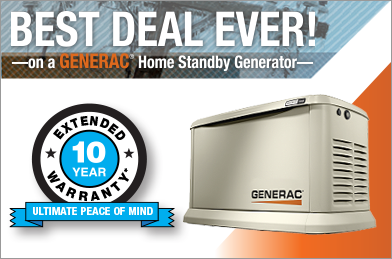 With that said, it may seem as if a standby generator isn’t a good deal, but you may be surprised. First of all, you will need to check with your fuel provider regarding the cost of fuel if you are not already aware of the cost. However, the average cost to run each month for 15 minutes (monthly test mode) should be only $4 to $5 per month. That means you will pay approximately $60 per year to run your generator in test mode. If you run the generator at 50% load for an hour a month, the cost is only going to be around an average of $30. That is much less than the losses that can be experienced through spoiled food, lost business (if using the generator for a business), or having to stay in a hotel room. It is also important to consider that your power is most likely not going to go out every month. The cost of generator maintenance is going to depend on what you work out with the generator company as far as your maintenance schedule. When you compare the cost of maintenance to prevent problems to the cost of repairing a preventable issue, you save money. Generator maintenance is affordable and is an integral part in making sure you have power when there is none provided by the utility. When your unit is well-maintained, repairs should be far and in between. Any repairs that are done should be small repairs rather than major costly repairs. Plus, you aren’t necessarily going to have a repair every year. If you go an entire year without a power outage and no repairs, then your annual cost is going to be limited to the $60 per year worth of fuel costs for testing and your maintenance costs. When you compare those dollar amounts to how much a power outage can cost you, the annual cost of a generator is not very significant. In fact, it could save you money in other areas of your life.